This is a weekly trading tips series called ’Writing On The Wall’, in which our game theory guide, Eric Wall, tries to decipher those writings. This week, shorting bitcoin. I absolutely abhor having to short bitcoin. As a long-term believer in bitcoin, it goes very much against my beliefs to short what I consider to be the best and most undervalued financial asset in the world. Moreover, when the price is constantly making new all-time highs, there are no metrics, indicators or tools that can be used to reliably estimate resistance levels or reversal points. Calling the top is basically a guessing game. Therefore I usually avoid shorting bitcoin at all cost, except for under very rare and extreme circumstances. Also read: Trading Column `The Writing on the Wall´ – What Will CME Bitcoin Futures Do to the Price? As I have reasoned in my previous posts on this topic, the phenomenal bull run bitcoin has had since $6,500 may have been mostly driven by the idea of bitcoin as an emerging asset class, where retail investors have been presented with the awesome opportunity of getting in just before Wall Street does. While analysis tells me that the CME (and even more so Cboe) bitcoin futures comprises a net positive for the price of bitcoin, I don’t believe the full effects of it will be immediately visible on launch day (10 Dec for Cboe, 18 Dec for CME). Listing the instrument on an exchange is only the first step; there are other hurdles that will need to be crossed before the instruments can be traded. For instance, it requires the clearing firms of the clearinghouse to clear the instruments for its clients and brokerages to offer them to end-investors. For the institutional investors, there is usually some decision making process and risk analysis that needs to be done before they can invest. With the Cboe announcing their launch date only a week ago, I find it highly unlikely that they will dominate the global bitcoin market on the first week of trading. What should have a much larger short-term impact on the price is the sudden disappearance of retail buyers jumping on the idea of getting-in before Wall Street. Now, at $10,000, this wouldn’t have been enough for me to enter a sizeable short position on the greatest financial asset of all time. However, if you add another $6,000+ in less than a week and the fact that we’re going into a weekend (when no new fiat can hit the exchanges) to the mix, the desire to at least decrease my exposure to bitcoin temporarily becomes too intense to pass up. Observing the recent extreme volatility, it is very clear to me that the market is overheated and could collapse for even lesser reasons than the ones I’ve detailed. However, selling a chunk of bitcoin at a spot exchange is not a very attractive option due to taxation and custodial risk. The other option is entering a leveraged short position, which allows you to decrease your exposure without leaving nearly as much funds on an exchange. As such, I’ve decided to short the Great Bitcoin Bull. Shorting on Bitmex comes with a price limit at which you get forcibly liquidated, so the timing is really delicate. It is then not very helpful that the price is extremely volatile. As I mentioned earlier, calling the top with precision is mostly guesswork, yet still very important. Perhaps that can explain why so many traders seek aid by looking for special clues in the patterns of the graphs to help with this crucial task–the art known as technical analysis. The Head & Shoulders Pattern (H&S) is a pattern described on Investopedia as a “specific chart formation that predicts a bullish-to-bearish trend reversal” and that it “is believed to be one of the most reliable trend reversal patterns”. Note the word “believed” in the latter sentence; technical analysis is not empirically proven. Nevertheless, the H&S pattern is one of the most commonly mentioned indicators on /r/BitcoinMarkets, and is commonly used by many technical bitcoin traders. As such, it stands to reason that the formation of such a pattern may be a self-fulfilling prophecy in the sense that it can cause a psychological trick which causes traders to cause the price movement they were predicting, and may be the trigger that bursts a bubble that for other reasons was already bursting. 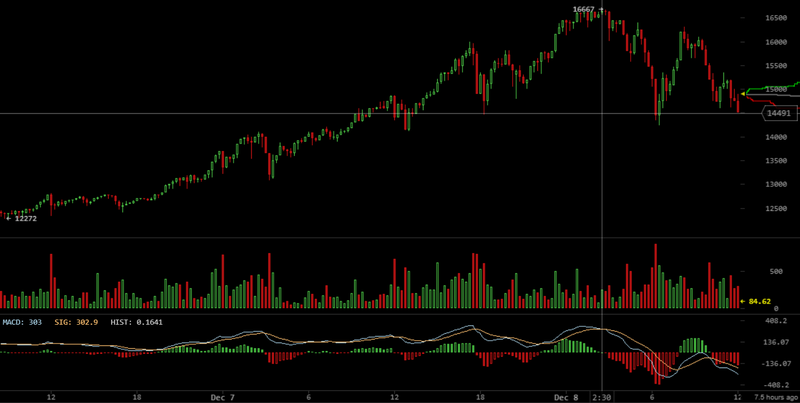 As we can see in the graph above, a H&S pattern has formed for bitcoin. Whether or not this really is a meaningful indicator to trade by is not yet proven, but for me, this is an as good an exit point as any. I entered a sizeable short position at the price of $16,236.40 on Bitmex, a few hours after the pattern was formed on the graph above. The market during this weekend will probably be exceptionally shaky, so it’s best to try to not to look too much at the price in order to avoid getting scared out of one’s position. Set your stop losses, and may the gods be ever in your favor. What do you think about shorting bitcoin? Let us know in the comments section below. Images courtesy of Shutterstock, Pixabay. Eric Wall is a Stockholm-based software engineer and cryptocurrency trader. He works at a world-leading financial IT infrastructure provider as a blockchain & cryptocurrency domain expert and holds a M.Sc.Eng. in Information and Communication Engineering Technologies from the Faculty of Engineering (LTH), Lund University, where he specialized in blockchain technology.